tablet coating: talc purified, hypromellose, titanium dioxide , propylene glycol , color red E-110. Atenolol is a beta-adrenoceptor blocking agent for use in the management of hypertension and angina pectoris. It is a cardioselective beta-blocker selective for cardiac beta1 receptors and has no partial agonist or membrane stabilising activity.The mode of action of atenolol and other beta-blockers in the moderation of hypertension is still not fully understood although its effects on plasma renin and cardiac output are probably of primary importance. Atenolol reduces cardiac output, alters baroreceptor reflex sensitivity and blocks peripheral adrenoceptors. Atenolol has been found to reduce systolic and diastolic blood pressures by about 15% in patients with mild to moderate hypertension. Its beta-adrenoceptor antagonist properties reduce cardiac work. This property improves exercise tolerance in anginal patients. 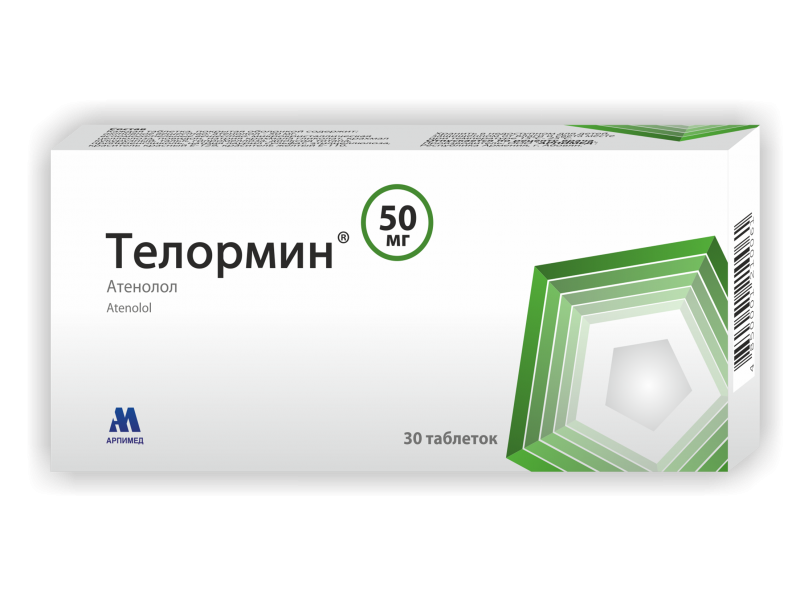 Atenolol is not completely absorbed from the gastrointestinal tract, its oral bioavailability being of the order 50-60%. It is approximately 5% bound to plasma proteins. The plasma half-life of atenolol is about 6 hours. However, the duration of therapeutic effect is much longer than this, allowing once daily dosing. Atenolol is excreted largely unchanged in the urine and its dosage should be adjusted in renal failure. Atenolol is recommended for the treatment of hypertension, angina pectoris, cardiac dysrhythmia, and for early intervention in the acute phase of myocardial infarction. Angina: Usually 100mg daily or 50mg twice daily. Dysrhythmias: Following control with intravenous atenolol, a suitable oral maintenance dosage is 50-100mg daily, given as a single dose. Myocardial Infarction: Following treatment with intravenous atenolol, oral atenolol 50mg may be given approximately 15 minutes later, provided no untoward effects occur from the intravenous dose. This should be followed by a further 50mg orally 12 hours after the intravenous dose and subsequent dosage maintained, after a further 12 hours, with 100mg daily. If bradycardia and/or hypotension requiring treatment, or any other untoward effects occur, atenolol should be discontinued. Renal impairment: The dose may need to be reduced. Hepatic dysfunction: The dose may need to be reduced. There are inadequate clinical data available on the use of atenolol in children and for this reason it is not recommended. Cardiovascular: Heart failure, heart block, bradycardia, hypotension, dizziness, peripheral vasoconstriction with coldness of the extremities (including exacerbation of intermittent claudication and Raynaud’s phenomenon). (see 4.4, Special Warnings and Precautions for Use). Eye : Visual disturbances including blurred vision, sore eyes, dry eyes (reversible on withdrawal; discontinuance of the drug should be considered if any such reaction is not otherwise explicable), conjunctivitis. Gastrointestinal: Nausea, vomiting, diarrhoea, constipation and abdominal cramps, sclerosing peritonitis and retroperitoneal fibrosis. General: Fatigue, headache, dry mouth, sleep disturbances of the type noted with other beta-blockers have been reported rarely. An increase in (A)nti (N)uclear (A)ntibodies has been seen: its clinical relevance is not clear. Haemopoietic: Thrombocytopenia, eosinophilia and leucopenia including agranulocytosis. Metabolic: Lupus-like syndrome. Hyperglycaemia or hypoglycaemia. Non-diabetic patients susceptible to hypoglycaemia include those on regular dialysis, and long term patients who are nutritionally compromised or have liver disease. Atenolol may increase serum triglyceride levels. Musculoskeletal, connective tissue and bone disorders: Myopathies including muscle cramps, arthralgia. Nervous system: Paraesthesia, peripheral neuritis. Psychiatric: Depression, psychosis, hallucinations, confusion, anxiety and nervousness. Respiratory : Bronchospasm, pneumonitis, pulmonary fibrosis and pleurisy. Care should be taken when using beta-blockers in patients with poor cardiac reserve. Myocardial contractility must be maintained and signs of failure controlled with digitalis and diuretics. Therapy should not be withdrawn abruptly, especially in patients with ischaemic heart disease, and replacement therapy should be considered to prevent exacerbation of angina pectoris, rebound hypertension, myocardial infarction, ventricular arrhythmias and sudden cardiac death . Treatment should not be discontinued abruptly in patients on long-term therapy, but should be discontinued over one to two weeks.If a beta-blocker is withdrawn prior to surgery it should be discontinued for at least 24 hours, if the patient is being anaesthetised. If beta blockers are not discontinued before anaesthesia, the anaesthetist should be made aware of the beta-blocker therapy. A drug such as atropine may be given to counter increases in vagal tone. Anaesthetics causing myocardial depression such as ether, halothane and enflurane should be avoided . Atenolol reduces heart rate. In instances when symptoms may be attributable to the slow heart rate, the dose should be reduced. Beta-blockers should be used with caution in first degree AV block. Beta-blockers may increase both the sensitivity towards allergens and seriousness of anaphylactic reactions and may also reduce the response to adrenaline. They may unmask myasthenia gravis or potentiate a myasthenic condition. Patients with psoriasis should only be given beta-blockers after careful consideration, as psoriasis may be aggravated. Atenolol should be used with caution in diabetics subject to frequent episodes of hypoglycaemia. Symptoms of hypoglycaemia and of hyperthyroidism may be masked . If the use of atenolol in patients with asthma or a history of obstructive airways disease is unavoidable, the risk of inducing bronchospasm should be appreciated and appropriate precautions taken. If bronchospasm occurs, this will usually be reversed by commonly used bronchodilators such as salbutamol or isoprenaline. In patients with renal impairment or hepatic dysfunction, atenolol should be used with caution and reduction of dosage should be considered . Atenolol is contra-indicated in patients with a known hypersensitivity to atenolol, severe bradycardia, second degree or third degree heart block, uncontrolled heart failure, hypotension, severe peripheral vascular disease (including intermittent claudication), sick sinus syndrome, cardiogenic shock, phaeocromocytoma (without a concomitant alpha-blocker), metabolic acidosis.Although cardioselective beta-blockers may have less effect on lung function than non-selective beta-blockers, as with all beta-blockers these should be avoided in patients with asthma or a history of reversible obstructive airways disease or bronchospasm , unless there are compelling clinical reasons for their use. Treatment: Absorption of any drug material still present in the gastrointestinal tract can be prevented by gastric lavage and administration of activated charcoal. Excessive (therapeutic) bradycardia can be countered by atropine sulphate 0.6 to 2.4 mg in divided doses of 600 micrograms. Acute massive overdosage requires hospital management and expert advice should be obtained. Maintenance of a clear airway and adequate ventilation is mandatory. Excessive bradycardia and hypotension may be countered by atropine, (3 mg adult, 40 micrograms/kg child) intravenously. Cardiogenic shock unresponsive to atropine may be treated with an intravenous injection of glucagon (50-50 micrograms/kg in 5% glucose, with precautions to protect the airway in case of vomiting). A further dose of glucagon (or an intravenous infusion) may be required if the response is not maintained. If glucagon is not available intravenous isoprenaline is an alternative. Administration of calcium ions, or the use of a cardiac pacemaker may also be considered. In patients intoxicated with hydrophilic beta-blocking agents, which include atenolol, haemodialysis or haemoperfusion may be considered. Aldesleukin : Enhanced hypotensive effect. Alprostadil : Enhanced hypotensive effect. Ampicillin: Reduces atenolol serum levels. Anaethetics: Enhanced hypotensive effect. Avoid anaesthetics which cause myocardial depression, e.g. ether, halothane and enflurane (see 4.4 Special Warnings and Precautions for Use). Analgesics: Antihypertensive effects of beta-blockers may be impaired by non-steroidal anti-inflammatory drugs (NSAIDs), particularly indomethacin – avoid concomitant use. Antacids : Reduced absorption may occur if calcium or aluminium hydroxide is administered concurrently. Antiarrhythmics and other drugs affecting cardiac conduction: (eg, disopyramide, amiodarone, quinidine) additive negative inotropic effects on the heart, with increased risk of bradycardia, hypotension, ventricular fibrillation, heart block or asystole – avoid concomitant use. Antidepressants and antipsychotics: Phenothiazines and tricyclic antidepressants and tropisetron may increase the risk of ventricular arrhythmias Enhanced hypotensive effect with monoamine oxidase inhibitors (MAOIs). Antidiabetics: Dosage of hypoglycaemic agents requirements may need to be increased (see 4.4 Special Warnings and Precautions for Use). There may be an enhanced hypoglycaemic effect and masking of warning signs with concurrent administration of insulin and oral antidiabetic drugs. Hypoglycaemia is more likely in Type I than in Type II diabetics and may be associated with delayed recovery. Antihypertensives, including angiotensin-converting enzyme (ACE) inhibitors and angiotensin-II antagonists; enhanced hypotension; alpha-blockers; enhanced risk of first dose hypotension – avoid concomitant use. Cardiodepressant calcium channel blocking agents such as diltiazem, nifedipine and verapamil may induce negative inotropic effects such as severe hypotension, bradycardia, asystole and heart failure avoid concomitant use. Antimalarials: Risk of bradycardia increased with mefloquine. Anxiolytics and hypnotics : Enhanced hypotensive effect with benzodiazepines. Cardiac glycosides: Risk of marked bradycardia and AV block. Ergot alkaloids: Increased peripheral vasoconstriction – avoid concomitant use. Moxisylyte: Increased risk of severe postural hypotension. Oestrogens and Progesterones : Oestrogens and combined oral contraceptives may antagonise the antihypertensive effect. Sympathomimetics : Risk of severe hypertension and bradycardia with such agents as adrenaline, noradrenaline and ephedrine – avoid concomitant use. Beta-blockers may also reduce the response to adrenaline in the management of anaphylaxis (see 4.4 Special Warnings and Precautions for Use). Ulcer healing drugs: Carbenoxolone may antagonise the hypotensive effect. Orange , biconvex, coated tablets, scored , odorless, without taste, white or almost white on breaking with bitter taste. 30 tablets, 3 blisters (1 blister packet with 10 tablets) with leaflet in the cardboard box.